You'll be £15.99 closer to your next £10.00 credit when you purchase Julius Caesar's Invasion of Britain. What's this? Two thousand years ago Julius Caesar came, saw and conquered southern Britain, but just where he landed and the precise routes his army marched through the south of the country have never been firmly established. Numerous sites have been suggested for the Roman landings of 55BC and 54BC, yet, remarkably, the exact locations of the first major events in recorded British history remain undiscovered – until now. After years of careful analysis, Roger Nolan has painstakingly traced not only the places where the Romans landed, but he has also discovered four temporary marching camps Caesar’s army built as it drove up from the south coast in pursuit of the British tribal leader, Cassivellaunus. This advance took Caesar across the Thames to Cassivellaunus’ stronghold at Wheathampstead in present-day Hertfordshire. These marching camps are placed almost equidistant from each other and, most importantly, are in a straight line between the coast and Wheathampstead. Roger Nolan’s research has also enabled him to identify the place mentioned in Caesar’s Commentaries, where the Roman legions were ambushed by the British whilst foraging and where a large battle then ensued – the first known land battle in Britain. Without doubt, this ground-breaking study is certain to prompt much discussion and reappraisal of this fascinating subject. Roger Nolan has had a life-long interest in the history of Roman Britain. 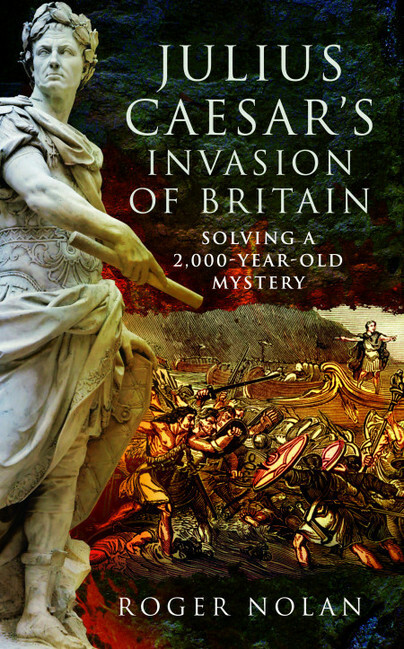 Following many years of research into the historical and archaeological evidence surrounding Julius Caesar’s invasions of the UK, this is Roger’s first book. Having worked in a number of commercial and financial undertakings, Roger is retired and lives in Kent.